Campaign on "Giving Tuesday" Benefits PATH Intl. The Giving Library, an online video archive that connects donors to nonprofits, is kicking off a $100,000 "Share to Give" campaign on Giving Tuesday, the national day of giving, which is TODAY, December 3. Visitors to the Giving Library website are able to view videos for hundreds of charitable organizations across the United States. By signing up for a free "library card," viewers can show their support for PATH Intl. by sharing our video on Facebook or Twitter. 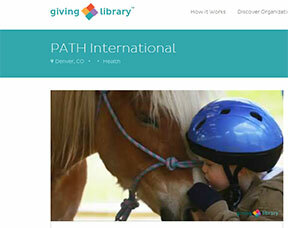 The Giving Library will then donate $5 to PATH Intl. This is a way for you to support PATH Intl. without spending any money this holiday season. All you have to do is share the PATH Intl. Giving Library video on Facebook or Twitter, and the Giving Library will donate $5 to us. It's that simple! PATH International Equine Services for Heroes is partnering with Wounded Warrior Project to provide equine-assisted activities and therapies (EAAT) for WWP Alumni. WWP has made a significant gift to PATH International for the purpose of awarding scholarships for EAAT to WWP Alumni who have expressed an interest in therapeutic horsemanship. The scholarships are available for WWP Alumni to ride at PATH International Premier Accredited Centers across the country. Click here for more information or contact Rachel Johnston with questions. PATH Intl. is pleased to present Kelly Rodgers, our newest PATH Intl. Certified Master Instructor. PATH Intl. Master Instructor Certification is the highest certification level an instructor can achieve through PATH Intl. Through dedication, hard work and extensive knowledge, Kelly has now joined ranks with this elite group of only 31 instructors. PATH Intl. Master Instructors are looked on as role models in the industry. They embody the spirit of PATH Intl., elevating the dignity, knowledge and professionalism of the entire therapeutic horsemanship team. Kelly has clearly demonstrated that she has a strong a background in horsemanship and teaching as well as a thorough knowledge of a variety of physical, cognitive, intellectual and emotional disabilities and their relationship to therapeutic riding and other equine-assisted activities and therapies. 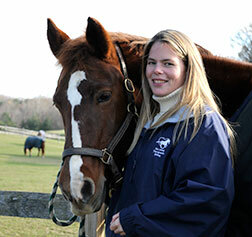 Kelly has been the Program Director at Maryland Therapeutic Riding, a PATH Intl. Premier Accredited Center, since 2008. 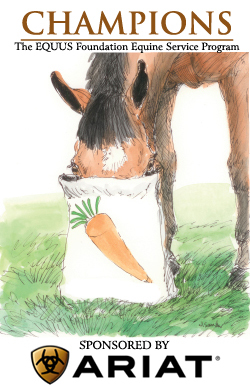 She has a Bachelor of Science degree in Equine Studies with a concentration in Equine Business Management from Centenary College of New Jersey. During her time at Centenary, she volunteered in the TRAC program (Therapeutic Riding at Centenary) and also completed the PATH Intl. Approved Training Course under the direction of Octavia Brown. She is a PATH Intl. Equine Specialist in Mental Health and Learning, Associate Site Visitor, Instructor Mentor, Apprentice Evaluator, Maryland State Chair and a Special Olympics coach. Kelly loves the collaborative nature of PATH Intl. and looks forward to connecting with many others to continue promoting excellence in EAAT. Kelly, on behalf of PATH Intl. and the master panelists, we applaud you on your remarkable achievement! Thank you for perpetuating the future excellence and quality assurance of EAAT and PATH Intl. Click here for information on the PATH Intl. Master Instructor Certification. More Than a Mirror by Shannon Knapp is now available for purchase. More Than a Mirror offers a thorough examination of theory and practice of equine-assisted psychotherapy (EAP) as a therapeutic intervention. Leading practitioner Shannon Knapp, M.A., of Horse Sense of the Carolinas, integrates emotional/social intelligence, neuroscience and learning theory as well as a step-by-step examination of EAP as practiced today. Click here (or on the image) for information on how to order. "This book is a wonderful example of the power and spirit of collaboration." Rebecca Wara-Goss, a registered Marriage and Family Therapist Intern and a PhD in Transpersonal Psychology student at Sofia University in Palo Alto, CA, is preparing her dissertation research to investigate the effectiveness of equine-facilitated psychotherapy (EFP) treatment for combat veterans with post-traumatic stress disorder (PTSD). She is in the process of interviewing a potential dissertation committee member who would serve as her topic expert. She is seeking someone who has clinical or professional experience working with combat veterans, and/or in equine-related work with combat veterans, and may have experience serving on doctoral committees. Her school's requirements for the committee member are to have an advanced degree such as PhD, PsyD, or MD, and to have published their work/areas of interest in academic journals and professional forums. The school will give a modest compensation to the new committee member. Please email Rebecca if you are interested in assisting with her doctoral research, and/or have additional questions or comments. Thank you for your time. PATH Intl. will continue an innovative partnership with the American Paint Horse Foundation designed to help train therapeutic riding instructors. This alliance, which was founded in 2013, provides scholarship assistance to potential PATH Intl. instructors. While open to anyone with skills in equine management, horsemanship, instruction, teaching methods and disabilities, preference for scholarships will be given again to medical professionals. The average cost to participate in a PATH Intl. certification workshop and test, which takes place over three days, is $800. The American Paint Horse Foundation seeks to assist individuals interested in certification through the awarding of one-time, $800 scholarships. Learn more about how the foundation benefits the lives of American Paint Horses and their enthusiasts at aphfoundation.org.To apply for an American Paint Horse Foundation PATH Intl. scholarship, email Jan Anderson or call her at (817) 222-6414. Applications should be postmarked by March 1, 2014. Scholarship recipients will be notified by April 15, 2014.